Born and raised in northern NJ, David moved into the city upon earning his undergrad degree in business from Pace University. He then went on to spend the next 10+ years in the corporate sector, functioning in various capacities, including Six Sigma consulting, project management and IT. 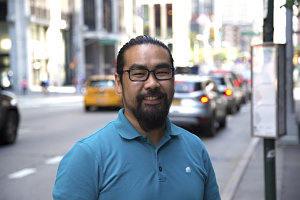 David joined the inaugural class of Reformed Theological Seminary NYC and having recently graduated, he is now enrolled in the Redeemer City Ministry Year. David has been attending Redeemer since 2001, with Downtown being his church home for the last three years. In August, he joined the DT Community Group team as an intern. He currently lives in Prospect Lefferts Gardens with his faithful corgi, George. In his time off, he can be found in his bed catching up on sleep. When awake, he can be found exploring Brooklyn with George, snowboarding with his brothers, or simply hanging out with his friends over drinks and food. He also wants everyone to know that dogs are better than cats.